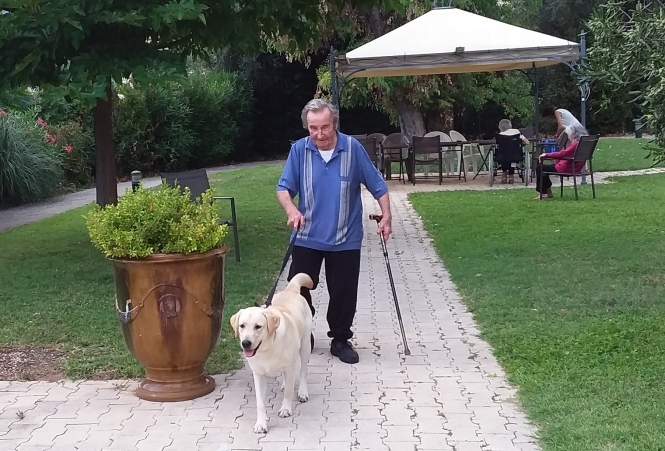 In what is thought to be a first, the Orpéa Mimosas Ehpad at Magagnosc in Alpes-Maritimes has worked with a guide dog training school to train Nestlé, a golden labrador. The initiative has since won a prize at the Silver Show 2018 in Paris. The idea to become a famille d’accueil came from residents who wanted a companion and to do something to help others. Working with events coordinator Célia Ghalem, home manager Alexia Pratensi contacted L’Ecole Méditerranéenne de Chiens Guides D’Aveugles in Biot a year ago. Residents and staff have helped to train Nestlé. Staff said people react happily to seeing her and give plenty of hugs and affection. Visiting children also love playing with her in the garden. She has helped patients in reviving family memories but also with their own memory as each remembers her name, breed and age, plus how to care for her. Visits to the vet and other training routines also boost residents’ esteem as they rediscover forgotten social habits and get enjoyment out of making a social contribution. A special day was being planned for Nestlé to meet her new visually-impaired owner, Pedro.